Do you make New Year's resolutions? I always like to make a few but I keep them pretty manageable to set myself up for success. This year, in addition to vowing to tasting even more wines, I'm making a resolution to study and sip New World wines. You might be wondering, "What is a 'New World wine'? Isn't the whole world the same age?" Well, yeah, but the world of wine is divided in two parts: Old World and New World. Keep reading to learn the difference! A California wine fight I enjoyed in San Francisco a few years ago. 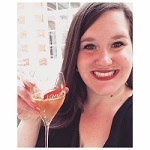 Keep up with my wine journey on Delectable! "Old World Wine: wines from countries or regions where winemaking (with Vitis vinifera grapes) first originated." "New World Wine: wines from countries or regions where winemaking (and Vitis vinifera grapes) were imported during and after the age of exploration." Vitis vinifera originated across Europe and parts of the Middle East in countries like France, Italy, Spain, Germany, Greece, and Turkey. It was imported to the "New World," aka the United States, Australia, New Zealand, Canada, South America, and South Africa. I'm very excited for this adventure in 2018, and hoping I will travel to California and/or Italy before we ring in 2019. Adventure and wine awaits! What's your wine resolution for 2018?